Subterrenean Press, US, 2009. Hardcover. Book Condition: As New. Dust Jacket Condition: As New. Vincent Chong (illustrator). First Edition, First Impression. Signed and illustrated by Vincent Chong (with an ink drawing based upon the film poster fot 1408) - 1st/1st fine/fine. The #1 bestselling author reflects on the filming of five of his most popular short stories, each tale included in this collection. Those movies are The Shawshank Redemption, 1408, Children of the Corn, The Mangler, and Hearts in Atlantis. Includes an introduction, his brief personal commentary, and behind-the-scenes insights by Stephen. The Subterranean Press edition of Stephen King Goes to the Movies is -- so far -- the only hardcover edition scheduled, and features full-color movie poster illustrations -- one for each story -- by Vincent Chong. This edition is smythe-sewn, printed in two colors throughout on 80# Finch paper, making it a perfect volume for your permanent shelf of favorite books. Limited: 2000 unsigned hardcover copies. 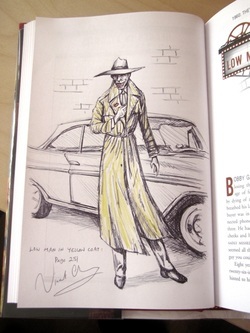 Signed by Illustrator Vincent Chong. 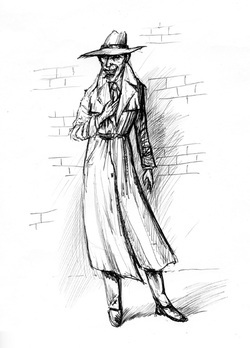 Please note - the images of the "Low Man in Yellow Coat" are already gone, but I thought you'd appreciate seeing them!